Your notebooks are private unless you choose to invite other people to view or edit its contents. Open the notebook that you want to share. 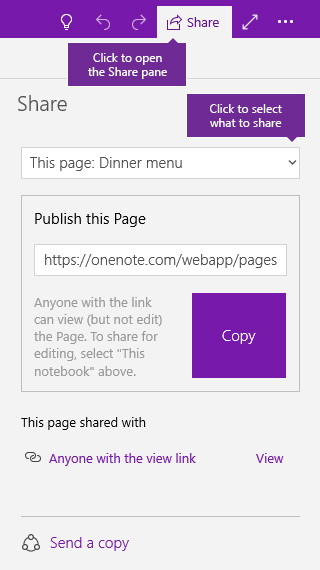 Near the upper right-hand corner of the OneNote app window, click Share. 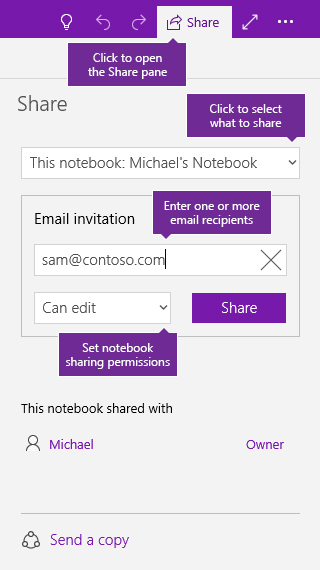 In the Share pane, select This notebook from the dropdown menu. Select Can edit if you want people to be able to view and edit the pages in your notebook. Select Can view if you want people to only be able to view your notebook, but not make changes to it. Click Share to email an invitation to the current notebook to the selected recipients. If you don’t want to share your entire notebook with other people, you can share a specific page. In your notebook, open the page that you want to share. In the Share pane, select This page from the dropdown menu. Click Create to create a Web link that you can share with other people. When the sharing link has been created, click Copy, and then paste the link wherever you want to share it. Follow these steps if you want to send a static snapshot of a page of notes or an entire notebook. Snapshots of notes won’t automatically update if the owner of the notebook makes changes to the original notes in the future. In your notebook, open the notebook or page that you want to share. 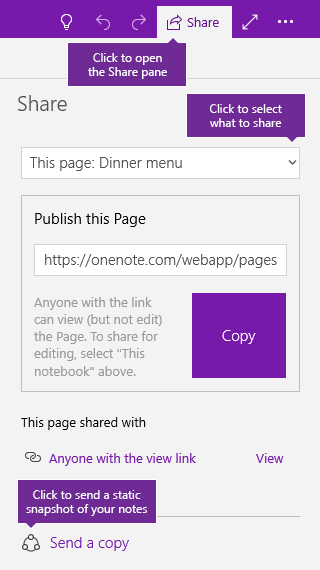 In the Share pane, choose whether you want to share a snapshot of This page or This notebook. At the bottom of the pane, click Send a copy. In the Share menu that opens, select the recipients, or select the app where you want to share (for example, the Windows 10 Mail app).